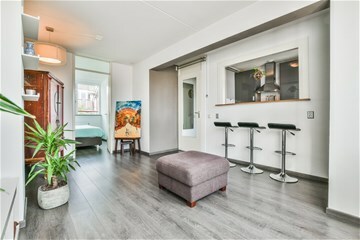 The apartment is located in a quiet street in the popular “Indische buurt”” area in Amsterdam East. This district has developed into a trendy city district, where you can live quietly and at the same time enjoy the bustling city. Have breakfast at the Drovers Dog, eat at Wilde Zwijnen or have a drink at Bar Basquiat? Everything is literally around the corner. 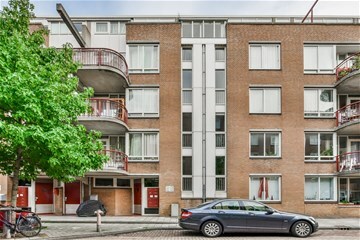 You get your groceries in the cozy Javastraat or at the Dappermarket and also the Oosterpark is close by. In 10 minutes you cycle to the Rembrandtplein or De Pijp and the public transport is also convenient here. Muiderpoort station is within walking distance, as are several trams and buses. The ringroad A-10 or A-1 are reachable within 10 minutes driving. There is currently no waitinglist for a parking permit. Via a spacious common staircase you reach the 5th and top floor via the gallery. Entrance hall, practical storage. Spacious bathroom with shower, sink and toilet. 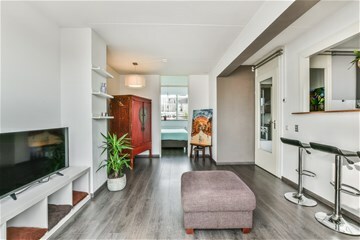 The sunny living room is adjacent to a wide balcony, where you can look out over the city. The modern kitchen has a large window to the living room where a cozy bar is made. The high gloss kitchen is equipped with several appliances such as a 4-burner gas hob, stainless steel extractor hood, oven, dishwasher and fridge / freezer. The central heating boiler (2006) and the washing machine are neatly concealed in a kitchen cabinet. 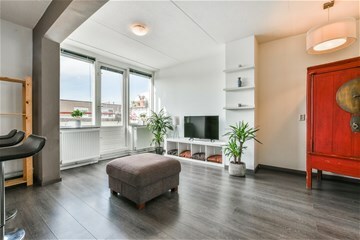 Both from the living room and the kitchen there’s a door to the extra deep balcony. The spacious bedroom is at the front. The house has a laminate floor and everything is nicely painted. 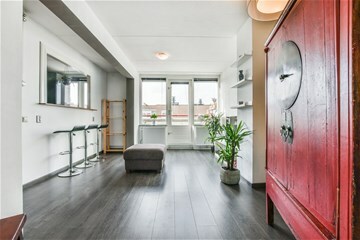 Finally, there is a spacious (bicycle)storage with a window on the ground floor. 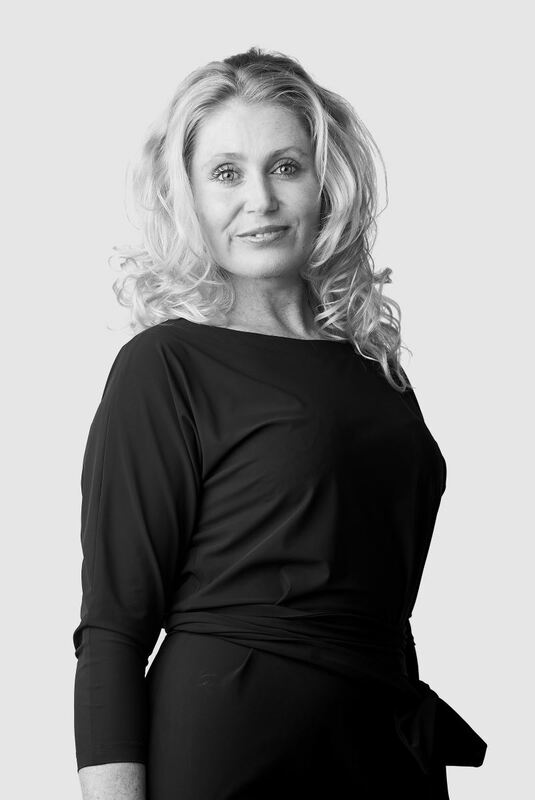 - The active VvE is professionally managed by De Alliantie. - The servicecosts are approximately € 82, - per month. - The VvE has a Long Term Maintenance Plan. 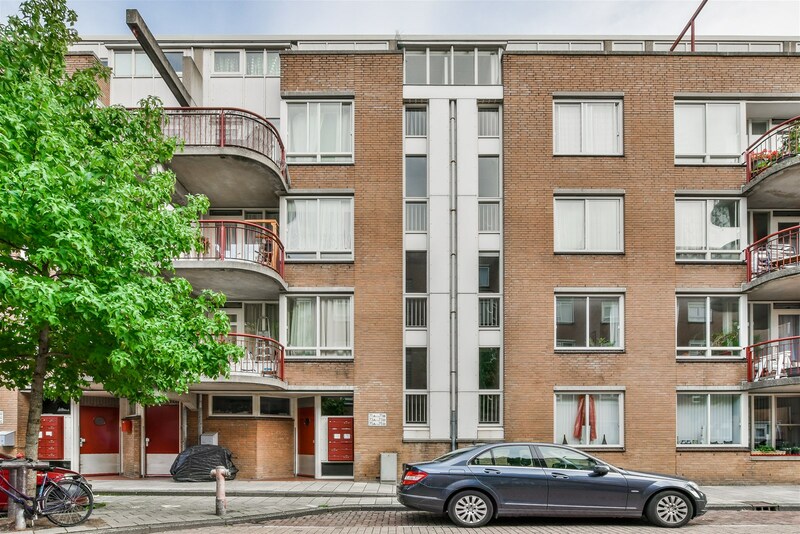 – 44.1 m2 of floorspace, excluding the balcony which measures 6,8 m² (NEN 2580-compliant measurement report available). 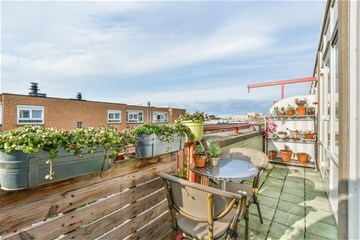 - Extra deep balcony over the entire width facing South. - Located at the top floor. - The groundlease (leasehold) is prepaid till 15-12-2035.